The ‘Special Report on Global Warming of 1.5 Degrees Celsius’ (SR15) released last week by the Intergovernmental Panel on Climate Change (IPCC) projected that the world has around 12 years before the increase in global atmospheric temperature is likely to reach 1.5 degrees Celsius above pre-industrial levels. This is a lower target than the two degrees Celsius increase agreed under the Paris Climate Agreement in 2015, which is projected to be damaging for low-lying areas and small islands nations. According to the report that also highlights avoidable climate change impacts by limiting global warming to 1.5 degrees Celsius compared to two degrees Celsius, the magnitude of exposure, risks and impacts to the natural and human systems between the two temperature points is disproportionately wide. This cuts across sea-level rise, extreme weather events, habitat loss, biodiversity loss, natural resource loss, human health, livelihoods, food security, water supply, human security and economic growth. Amidst the doom and gloom, there is still a ray of hope. While the atmospheric warming from past anthropogenic greenhouse gas (GHG) emissions will continue to cause long-term changes in the climate system, these emissions alone are unlikely to cause global warming of more than 1.5 degrees Celsius. Therefore, theoretically, limiting global warming to only 1.5 degrees Celsius above pre-industrial levels “is possible within the laws of chemistry and physics”, to quote Jim Skea, Co-Chair of IPCC Working Group III. This is provided the world could achieve 45 percent emissions reduction from 2010 levels by 2030, then reach and sustain net-zero emissions by 2050. Limiting global warming to 1.5 degrees Celsius is a monumental task that would require nothing short of “rapid, far-reaching and unprecedented changes in all aspects of society”. 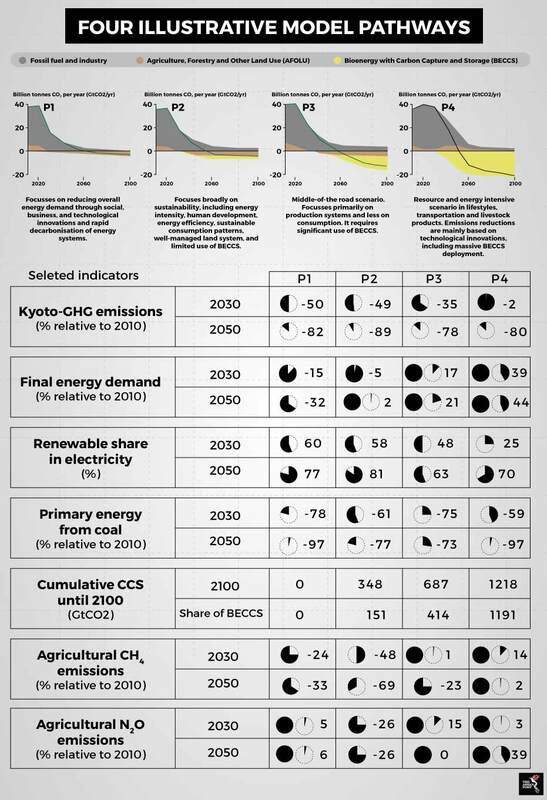 SR15 laid out four illustrative model pathways (P), three of which – P1, P2 and P3 – offer a future of little or no overshoot of the 1.5 degrees Celsius target. One pathway, P4, back-casted high overshoot. However, P4, along with P3, is back-casted to involve massive technological investment in C02 removal through deployment of bioenergy with carbon capture and storage (BECCS). Specifically, P1 focuses on reducing overall energy demand and rapid decarbonisation of energy systems. P2 has a broader focus on sustainability, including behaviour shift towards energy efficiency, sustainable consumption patterns, well-managed land systems, and limited use of BECCS. P3 is primarily focused on production systems and less on consumption, and requires significant use of BECCS. The last suggested pathway, P4, is resource and energy intensive, with significant use of BECCS. Climate change mitigation specialist, Mathias Varming, said that governments, including those in Southeast Asia, need to revisit their Nationally Determined Contributions (NDCs) under the Paris Climate Agreement as current NDCs have been deemed by the IPCC to be insufficient to limit global warming to 1.5 degrees Celsius above pre-industrial levels. According to Varming, if Southeast Asian governments are to heed the IPCC’s recommendations so as to ensure a safe future for all, they will need to cease their reliance on fossil fuels, coal in particular. While other parts of the world are phasing out coal, which is the most GHG-intensive fuel, Southeast Asian countries are currently ramping up the coal share in their energy mix. Heeding the evidence-based recommendations means that the deadline for ASEAN governments to cease construction of coal-fired power plants, which usually have a technical operational life of around 30 years, should be around 2020. “The way the report is structured, it is tempting to lean on BECCS to save the world as it allows for us to postpone climate mitigation actions. However, given the slow uptake of comparatively mature renewable energy technologies in recent decades, the large-scale adoption and deployment of BECCS is not guaranteed. If we start on the high overshoot trajectory and fail to follow up with the carbon removal measures, the consequences could be extremely severe and irreversible,” explained Varming. As framed by Debra Roberts, IPCC Working Group II Co-Chair, the next few years will be a critical and defining period in determining and sustaining a safe and sustainable world for all its population. It is critical that policymakers and practitioners use the available information to make the right decisions in tackling climate change.